Halloween is one of my favorite times of the year. It starts the season of great food and gatherings with family. 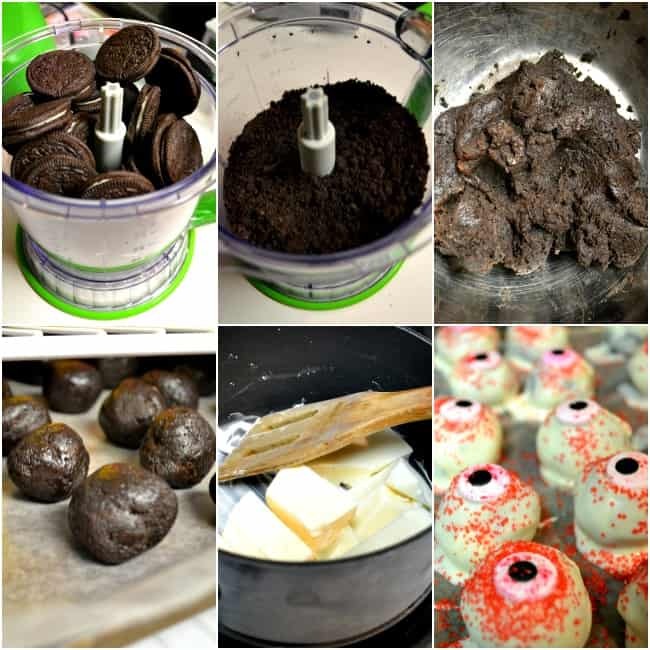 I made up a batch of my favorite oreo truffles which are great for any time of the year but for Halloween we spooked them up a little with some eyeball fun. This recipe is so simple and easy. 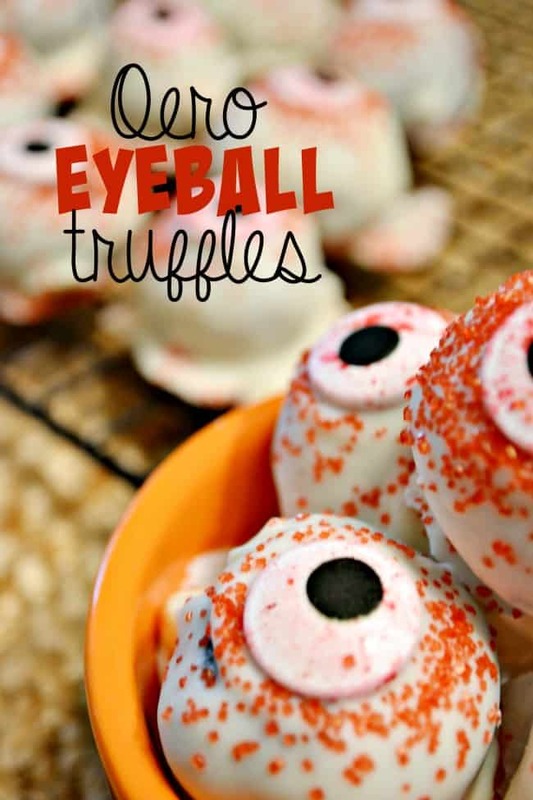 Outside of the extra embellishments for the eyeball portion it only requires 3 ingredients. Three ingredient recipes are my favorite!! Well unless you can make it a 2 or 1 ingredient and then lets talk. On to the deliciousness that are these truffles. Prep a cookie sheet with wax paper. Finely chop a whole package of Oreo’s. This is best done with a blender or food processor. Mix crushed Oreo’s in a bowl with the package of cream cheese. You can do this with a spoon but I prefer getting in there with my hands. It is a lot faster but I didn’t say less messy. Scoop mixture into approximately 1 inch balls and place on cookie sheet. This will yield approximately 30-35 eyeballs. Let the truffles set up in the freezer for 15 minutes while you are melting your almond bark. Once your almond bark is fully melted remove the truffles from the freezer and dip them in the chocolate. 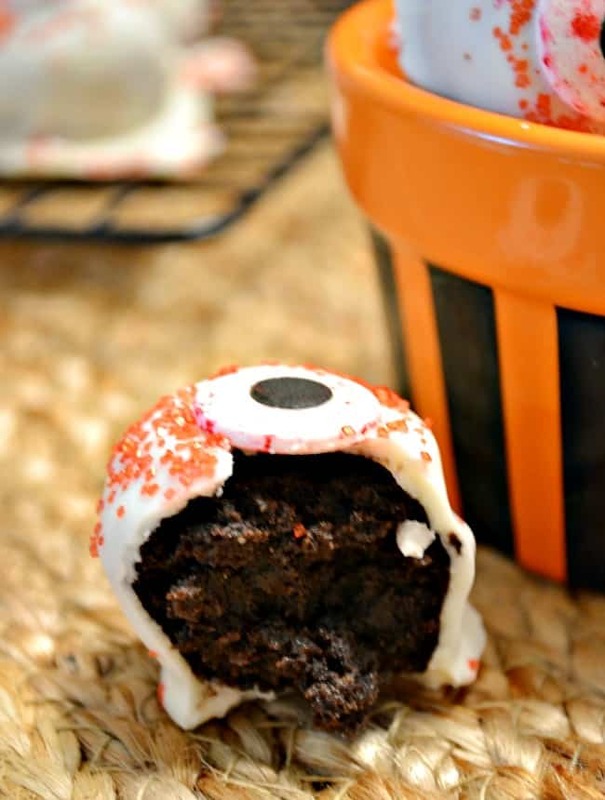 You will want to do this just a few at a time otherwise your chocolate may set up before you can apply the eyeball and sprinkles. 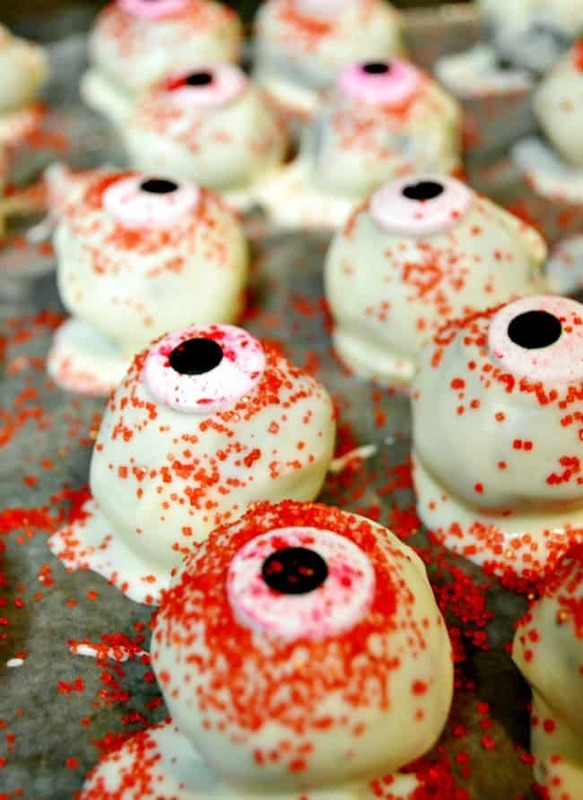 After you have dipped a few apply a candy eyeball to each and sprinkle with red sugar sprinkles. Continue dip and applying until you finish. Store in an airtight container in refrigerator. 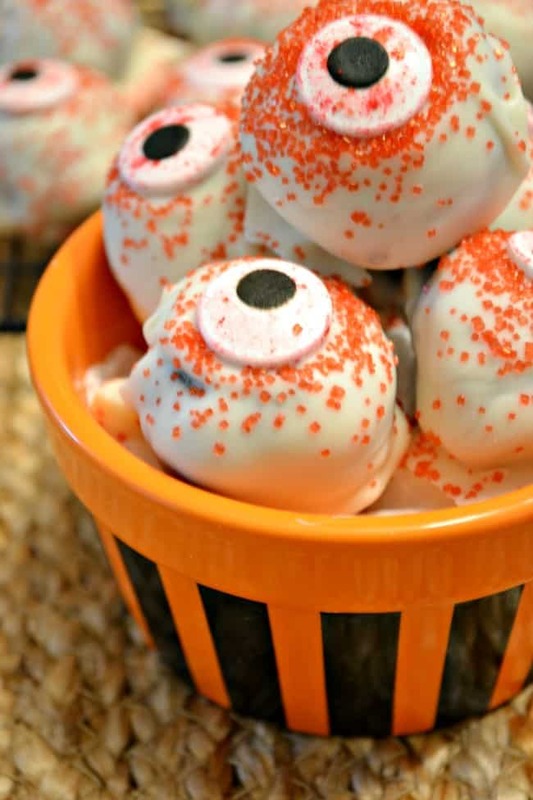 NOTE: You will not have enough eyeball candies unless you buy 2 packages. I decided to only do one and just sprinkled the rest with Halloween sprinkles. They taste just as good. It takes me about 30 minutes from start to finish to make these truffles so they also make a great last minute idea as well. Like I mentioned, they are great for all holidays. 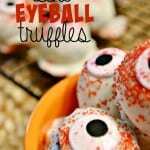 Skip the eyeball and add some Christmas sprinkles and you have the perfect potluck dessert recipe. Just make sure you have a gallon of milk handy because they are super rich. Finely chop a whole package of Oreo's. This is best done with a blender or food processor. Mix crushed Oreo's in a bowl with the package of cream cheese. You can do this with a spoon but I prefer getting in there with my hands. It is a lot faster but I didn't say less messy. NOTE: You will not have enough eyeball candies unless you buy 2 packages. I decided to only do one and just sprinkled the rest with Halloween sprinkles. They taste just as good. Glow in the dark Halloween luminaries!